Mix a light application of a balanced organic fertiliser into the soil prior to planting. In midsummer, drench plants with a liquid fertiliser to prolong bloom time. Sow gomphrena seeds indoors to get a head start, or outdoors where you want the plants to grow at about the time of your last spring frost. 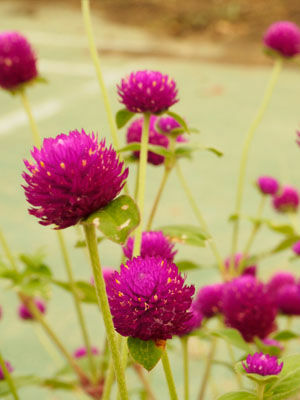 Many gardeners purchase gomphrena seedlings as inexpensive bedding plants. Allow 30cm(12 inches) between tall varieties. Gomphrena stems make long-lasting cut flowers. In warmer areas, gomphrena sometimes reseeds but it is never invasive. Colours include purple, white, and orange. Gather blossoms to use as cut flowers just after they open. If you like dried flowers, harvest blossoms when they have good colour, strip off the leaves, and hang them to dry in small bunches in a dry, well-ventilated place.